Around noon today (Monday, 12/31), a Clay-colored Sparrow was feeding on some spilled seed with a small flock of Savannah Sparrows and House Finches in the northernmost parking lot at Crown Point Park in Pacific Beach. A photo is in the eBird list below. Also the long-staying and cooperative Tricolored Heron was foraging in the SD river just west of Robb Field later in the afternoon. 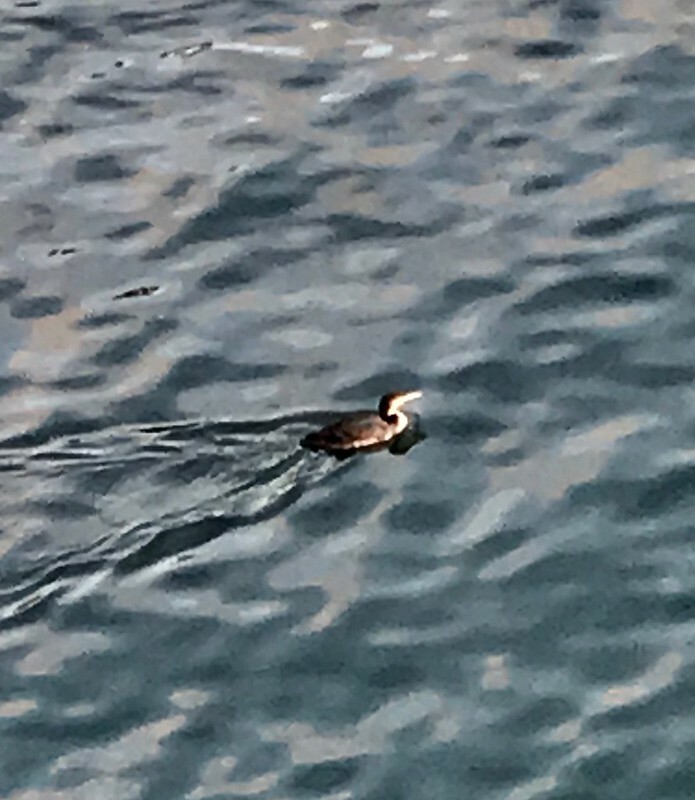 Yesterday at about 4:30 pm this Pacific Loon was paddling up and down the finger of San Diego Bay adjacent to NTC Park at Liberty Station. The blurred smart phone photos were taken from the bridge. I drew my circle, which includes several hotspots – Dos Picos, Collier Park, Rangeland Rd, etc. I’ll see what I can do! Maybe I can finally get a ZTHawk up here! Just a reminder that the San Diego Field Ornithologist New Year's Day Pelagic is only a couple days away. This is a six hour trip, sailing at 8 AM and returning around 2 PM. You can bring your own food or buy snacks on the boat. The trip departs from H&M Landing in San Diego Bay. It's recommended you arrive about 7:15 AM. Cost for members and their guest is currently $45.00. You may also pay your 2019 dues at that time ($25 per person and $35 for a family). Non-members need to ante up $80. If you have not yet paid for the boat, please bring your check (preferred method of payment) made out to SDFO or the correct amount of cash (I won't have change). Please do not call the landing. Hope to see you on the boat! Hats off to Nancy for an impressive run in 2018! As the New Year approaches, I wanted to encourage folks to take on a new kind of challenge in 2019. In the spirit of both birding locally and exploring areas that may receive little to no coverage, I would encourage folks to adopt a 5-mile radius patch (5MR) in 2019. Maybe many of you are already avid 5MRers, but if not, please read on. Basically, it's a super yard list – the sum of all birds seen within 5 miles of your house. Not sure how to figure that out? This tool (https://www.mapdevelopers.com/draw-circle-tool.php) allows you to zoom into your home location, and then create a 5-mile radius circle. It's incredible what falls inside that circle. Like yard list rules, you can count birds outside the circle, as long as you are inside the circle. For those of you who use eBird, it's best to set up a Patch (https://ebird.org/site/patch) of all the hotspots and personal locations you visit (you'll likely be creating new personal locations and visiting new hotspots regularly, so be sure to update your patch frequently). If you don't eBird (gasp! ), that's fine, just use a notepad or Excel or whatever database you currently use. Of course, you're free to continue with more traditional birding Big Years, but the 5MR challenge is more about exploring new areas and the excitement of finding new birds, and less about chasing (and/or missing) birds found by others. My year has come to an end, as I am headed to the airport and a new adventure (ANTARCTICA!!). As many of you know, I had a Big San Diego County Year in 2018. I really hadn’t planned on this, but the year began with such an exceptional number of rarities, it seemed possible to beat Barbara’s impressive record. Unfortunately, fall migration fizzled, and birds I had expected to get never appeared. My year ended with 384 species of ABA countable birds seen in San Diego county (I saw an additional 6 “non-countable” species as well). Most of the rarities I was able to document with photographs, with a couple of exceptions. The only “heard-only” birds (two owl species) were documented with recordings. There were 12 verified species seen in the county that I missed, half of which were on the ocean – Manx Shearwater, Guadalupe Murrelet, Ancient Murrelet, Black-legged Kittiwake, etc. Most of the land birds were on private property and could not be chased. I gave it my best, but came up short. All in all, I am happy with what I did accomplish. Brennan challenged us to keep yard lists this year as well – mine stands at 85 species seen this year. My Ebird checklist streak is 731 days – at least one checklist a day for 731 consecutive days. So those are my numbers – 384, 85 and 731 – all of which are pretty darn good numbers! I want to express my heartfelt thanks to all of you who reached out, offered encouragement, advised me, tipped me off about a bird, and/or stood sea watch with me. Many people took on the task of searching for specific birds for me. Dave Povey took me out on his boat several times to search the high seas, and Gary Nunn has been a constant source of encouragement. It touched my heart to recognize all the support offered to me. We have a wonderful birding community here in San Diego, and I feel privileged to be a part of it. My thanks to all of you. Happy New Year to everyone, and may 2019 be as good as 2018! P.S. Great birds are sure to show up on the 31st – get ready everyone! 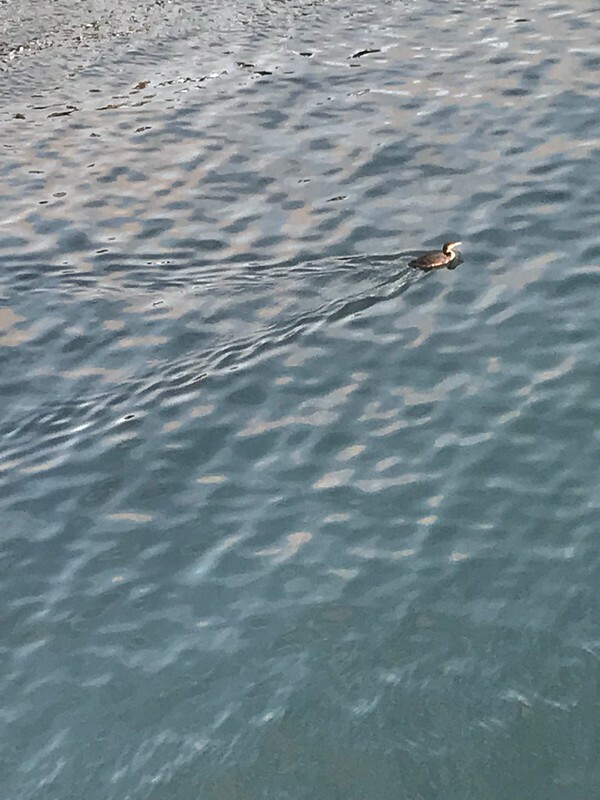 On the Oceanside CBC yesterday, our team on the Omni La Costa Resort had some interesting sightings I thought I’d share. First, although I’ve seen photos of this, I've never been sure they weren’t photoshopped. But I watched as a Cassin’s kingbird pursued a gliding red-tailed hawk, landed and perched on the hawk's back and pecked at the hawk's head for a few seconds before flying off. Second, we were watching some very active hummingbird feeders, hoping they might attract something unusual, when a black phoebe swept past one and caught a flying Allen’s hummingbird by the neck in its beak and flew off with it. They disappeared behind a bush, so we could not tell if it released the hummingbird at some point, or killed it and dropped it, or consumed it. Finally, on a dead tree on the north side of Poinsettia Lane just east of the corner of Estrella Del Mar Rd.–so outside our territory–we had a heavily streaked and utterly devoid of any warm colors Peregrine falcon that seemed to be of the pealei race. Very few records of this race in San Diego. Dec. 30, 2018; 6:30 a.m.